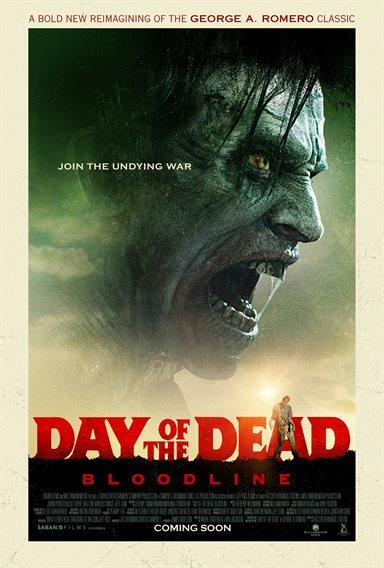 Download Day of the Dead: Bloodline in Digital HD from the iTunes store. 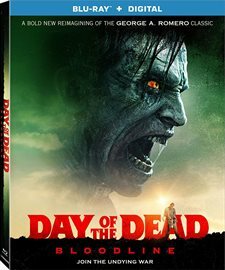 Day of the Dead: Bloodline images are © Lionsgate. All Rights Reserved. Day of the Dead: Bloodlines is the second remake of the bleak, George A. Romero film, released in 1985. This version of Day, Directed by Hèctor Hernández Vicens with the screenplay by Mark Tonderai and Lars Jacobson, brings us on the verge of humanity's destruction. Medical student Zoe Parker (Sophie Skelton), Miguel Salazar (Jeff Gum), Baca Salazar (Marcus Vanco), a small group of military personnel and some survivors dwell in an underground bunker as they seek to find a cure in a world overrun by zombies, which the others have dubbed 'Rotters.' Max (Johnathon Schaech), plays the Zombie-Rosetta Stone, whose mysterious blood may provide the solution to the zombie virus. The film begins ‘In medias res' as we bear witness to a gore-tastic zombie attack - I'm uncertain if the news crew reporting on the apocalyptic events are amazingly dedicated to their job, or horrifically unconcerned for their own safety, but we hardly have time to decide which, before we are treated to their bloody deaths. Soon enough, the gags ensue as people are snatched from their bicycles, vehicles refuse to start as their hapless owners are ripped through the windows, and people are turned into a living blood fountain. We soon realize that no one is making it out of this city alive. We then cut back ‘four hours earlier' to introduce us to Zoe and her unwelcome admirer, Max, and then, we are thrust forward ‘five years'. Zoe is part of a group of survivors, holed up in a military bunker and, out of medical supplies, they risk a supply run to the city to Zoe's old stomping grounds. While at the hospital, they pick up the drugs as well as Max, who has been waiting for the last five years, for what, we have no idea. Max, is special. He is the only zombie that still has all his obsessions intact so he not only recognizes Zoe, but he is still excited for her. Max must make her his. And so, madness and violence ensue, people are killed by zombies and the bunker doors are left open and the horde is let inside. Luckily, Zoe is a super-genius and a vaccine is developed in the nick of time. Humanity is saved from the brink of extinction. The film itself has many faults but one thing it does right is the makeup effects. Zombie Max looks creepy, and you definitely wouldn't want him to bite you. The F/X aren't half bad either and if you are just in it for the gore than you have something to look forward to, since it is presented in AVC encoded 1080p transfer in 2.38:1. The film is tweaked a bit and heavy on the blues, and greens, especially the interior shots in the hospital, which are dark but many of the interior bunker scenes, as well as the exterior shots, are brightly lit and have decent clarity. The blood ‘n guts are decently executed however, the one gripe I have is when the gore occludes the camera lens; this breaking of the 4th wall is senseless and annoying. Others may enjoy it, but I simply can't stand it. Bloodlines has just average sound with DTS-HD Master Audio 5.1. It has basic, yet workable, sound effects including a few jump-scares. The dialog is clear and the sounds of gunfire have a decent "punch" to it, not to mention the gut-munching goodness, are all very clear. The presentation falls flat as it offers only one short, Day of the Dead Bloodline: Reviving the Horror. It is just an ok, ‘making of', with various interviews with the cast and crew. As a general rule, I dislike remakes, especially those of "Classic" films that I love. Day of the Dead (1985) should have been left alone, twice. Although this film was light years better than the previous remake, it is nonetheless, the second failed attempt. Hopefully, they will finally let this monster rest in peace.